This impressive 6BR/6.5BA, side load three-car garage, brick and stone-front colonial on nearly a 1/2 acre lot built by Craftmark Homes features approximately 8,600 square feet of living area on four levels including: a great sense of light and spaciousness with 10-ft. ceilings on the main level, 8-ft. & 9-ft. on the upper level and 8.5-ft. in the walk-out daylight basement; elaborate mouldings & custom window treatments throughout; four fireplaces; hardwood floors on entire main level; elegant two-story foyer entrance with solid oak staircase & wrought iron balusters; formal living room with fireplace and dining room separated by decorative columns; main level library with built-in bookshelves and bay window; gourmet chef’s kitchen with cherry cabinets, granite countertops, granite center island with commercial vent hood, pendant and recessed lighting, upgraded GE Profile stainless steel appliances, and breakfast room; glorious morning room with granite bar, three walls of windows and triple French door to Trex deck with stairs to rear yard; family room with floor-to-ceiling stone fireplace, wet bar under rear secondary staircase and two windowed walls; main level mudroom/laundry room; generous master bedroom suite with cathedral ceiling and sitting room with two-way gas fireplace; luxurious master bath with designer ceramic tile flooring, two-person soaking tub, separate glass shower, and two enormous walk-in closets; four additional bedrooms on this level with three other full designer ceramic tile baths; BONUS fourth level loft with private bedroom suite and private sitting room/living room with two skylights; fully-finished walk-out lower level with recreation room, theater/media room (with 96-inch screen, projector and surround sound), stone fireplace, full designer ceramic tile bath, fitness room, and two huge storage rooms; Generac Guardian whole house generator; M&S full house intercom and sound system; aluminum fenced in rear yard. Fabulous light-filled corner two bedroom condo in a pet-friendly elevator building with South and West exposures overlooking serene green space. Close-in Bethesda location right outside the gates to NIH. Approximately 1100 sq. 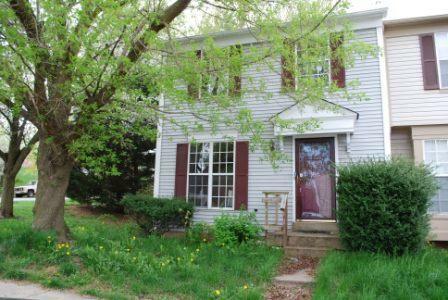 ft. of living space including NEW custom painting throughout and updated kitchen and baths for a move-in ready home. Formal living room and dining room combination with chair rail, crown moulding, and triple glass doors with slider to balcony; updated table-space kitchen with ceramic tile countertops and backsplash and newer appliances; master bedroom with crown moulding, custom window treatments, and a wall of closets with mirrored sliders & closet stretchers; additional bedroom with walk-in closet, crown moulding and custom window treatments; full bathroom with designer ceramic tile flooring and wall surround with listello border, tub and pedestal sink with NEW plumbing fixtures and vanity light. 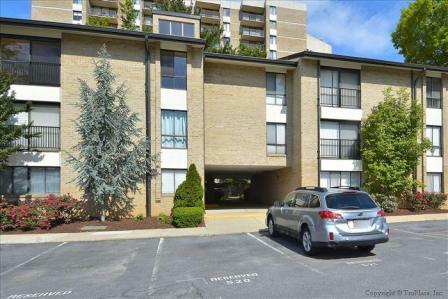 Whitehall Condominiums provide quiet, mature natural surroundings yet so close to everything that Downtown Bethesda has to offer within a few blocks to Medical Center Metro & Bethesda Metro. The condo fee includes all utilities, common area maintenance, and various amenities such as: outdoor pool; fitness center (in North building); laundry room right outside unit door on 4th floor; storage unit; two non-assigned surface parking spaces and plenty of visitor spaces; social room available to reserve; 24/7 staffed front desk (in North building); on-site management and engineer; seasonal HVAC maintenance; and car wash services. Public tennis courts are also right across the street. 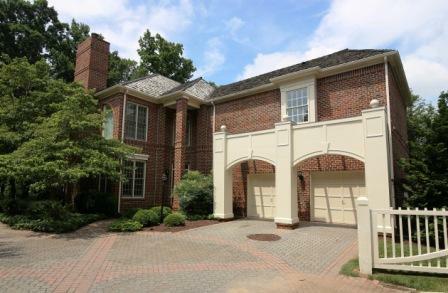 Spectacular 3BR/2FB/2HB end unit townhome with two-car garage and two-car driveway. This home features approximately 2,000 square feet of living area on three levels. Special features include a great sense of light and spaciousness with extra side windows and 9-ft ceilings; hardwood floors on entire main level; NEW carpeting on entire upper level; ceramic tile and Armstrong Alterna tile floors in all baths; elaborate mouldings and custom window treatments throughout. Foyer entrance into living room/dining room combination; gourmet kitchen with NEW granite countertops, center island breakfast bar, and breakfast area; family room with corner gas fireplace and entertainment niche above; master bedroom with tray ceiling, recessed lighting, ceiling fan, and two closets; designer ceramic tile master bath with soaking tub and separate shower; two additional bedrooms and a full hall bath on the upper level; full-daylight recreation room with designer 18-inch ceramic tile floors, walk-in storage closet, powder room, and laundry room. Conveniently located across from KF Village Center Shopping and Safeway, only a few blocks from KF Park, Pool & Community Center, with KF shuttle bus stop to Shady Grove Metro outside your door. The owner has meticulously maintained and improved the home as well as the gorgeous landscape to offer you a move-in ready home among the liveliness of King Farm. 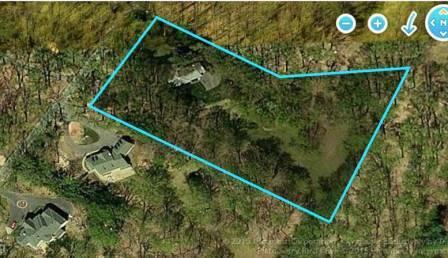 Incredible opportunity to build your dream home on this picturesque private 3.3 acre lot only a little more than a mile away from all of the shopping and restaurants of Potomac Village. Exquisite mature specimen trees and flowering perennials surround this private retreat. A three stall barn with tack room and loft exists on the property as well. Tiered topography rolling gently to the rear property line. The neighborhood is full of wonderful examples of how your future home could be positioned on the lot. The existing home being sold strictly “As-Is.” Public water and sewer available at the site for future connection. 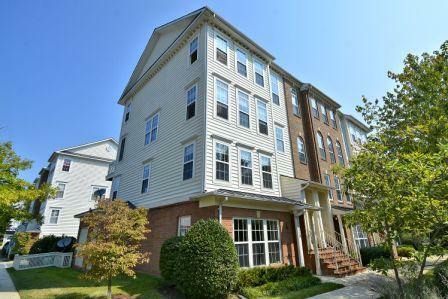 Fabulous, light-filled, 2BR/ 2.5BA two-level end unit condo/townhome with attached garage and private driveway in The Lakelands. Approximately 1,795 sq. ft. of living space with NEW custom painting and upgraded lighting throughout. Foyer entry with hardwood flooring; living room with gas fireplace and double windowed exposure opens to dining area, both with crown moulding; updated kitchen with hardwood flooring, NEW granite countertops and breakfast bar; powder room on main level with hardwood flooring and pedestal sink; master bedroom suite with walk-in closet and double windowed exposure; master bathroom with ceramic tile floors and Kohler whirlpool tub; second bedroom with double-door closet; full hall bathroom with ceramic tile flooring and tub surround; second floor family room with BONUS side window and sliding glass doors to expansive covered deck with two storage rooms; laundry closet on bedroom level. Prime location so close to everything that Lakelands/Kentlands has to offer including shopping, restaurants, movies, schools and community amenities like three pools, clubhouse with fitness center and party rooms, tennis courts, basketball courts, parks, tot lots, lighted team sports fields, and more. 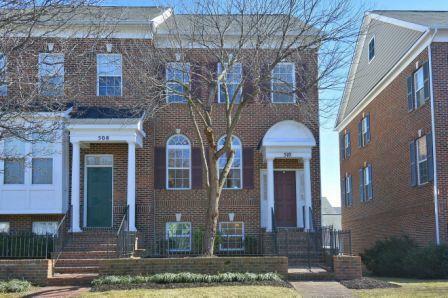 Classic, brick and stone remodeled 2BR/2BA townhouse located in vibrant Del Ray. This home boasts approximately 1,300 square feet of comfortable living space on three levels featuring: custom painting, recessed lighting, refinished hardwood and ceramic tile flooring. Living room opens to dining area; remodeled gourmet kitchen with maple cabinetry, stainless steel appliances, granite countertops and island/breakfast bar area with access to deck and backyard; first bedroom with two closets with built-in shelving and an additional closet for storage; spacious second bedroom with refinished hardwood flooring and closet with custom built-ins; full remodeled ceramic tile hall bath on upper level; fully finished walk-out lower level with NEW berber carpeting, ceramic tile flooring, recessed lighting and second full ceramic tile bath; separate laundry area; NEW hot water heater; NEWER replacement windows; fully fenced-in private backyard with deck and shed situated perfect for outdoor entertaining. 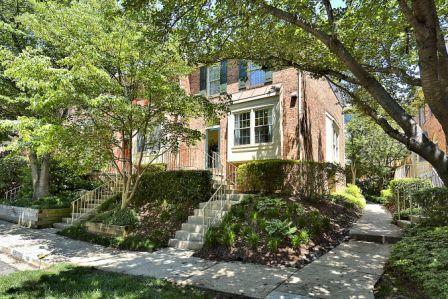 Ideal commuter location to DC from the Braddock Road Metro Station and close proximity to all the amenities that Historic Del Ray and Alexandria has to offer including restaurants, cafes, antique stores, farmers market and shopping. 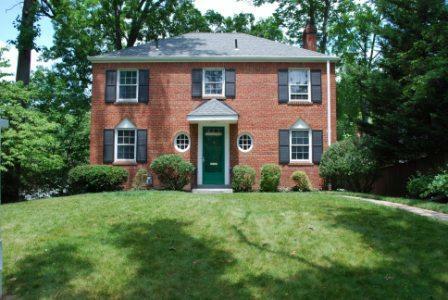 Classic all-brick 3-4BR/3.5BA colonial situated on a prominent corner lot in sought after Chevy Chase Section 4-B. Property has great size at almost 3,000 sq. ft. on three levels with great bones and a ton of potential. Hardwood floors throughout main & upper levels; formal living room with brick fireplace; formal dining room; main level study/den/4th bedroom with powder room; kitchen with breakfast area; separate mudroom; three spacious bedrooms upstairs with two full baths; partially finished basement with recreation room, full bath, and walk-out stairs; fully fenced-in backyard; deck off of kitchen; one-car side load garage and driveway; NEW roof. 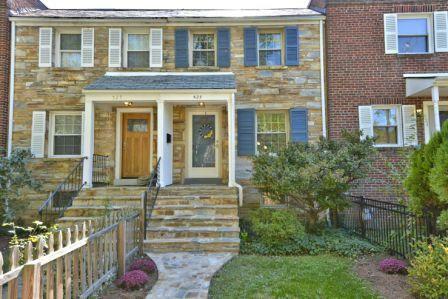 Incredible opportunity to renovate and live in the heart of Chevy Chase and minutes from downtown Bethesda. Extraordinary 5BR/5.5BA, three-sides brick colonial built by NV Homes backing to a conservation area and facing the neighborhood pocket park. The home features over 7,500 square feet of living area on three levels including: a great sense of light and spaciousness with 9-ft. ceilings on all three levels and a walk-out full daylight basement; custom painting, elaborate mouldings and choice window treatments throughout; elegant hardwood two-story foyer entrance with wide sweeping solid oak staircase; decorative fluted columns separating the formal living room with bay window and dining room both with hardwood floors; dramatic two-story family room with gas fireplace and windowed walls; gourmet kitchen with 42-inch cabinets, granite countertops, center island breakfast bar, upgraded KitchenAid & Whirlpool Gold stainless steel appliances, designer ceramic tile flooring, breakfast area, beverage center, and walk-in pantry; main level study with hardwood floors; main level mudroom with storage locker and front-load washer and dryer; generous master bedroom suite with tray ceiling and sitting area; opulent master bath with designer ceramic tile flooring, cherry and granite vanities, two-person Jacuzzi soaking tub, separate walk-in glass shower, and enormous walk-in closet; three additional bedrooms on this level all en suite with their own private designer ceramic tile baths; NEWLY finished full daylight, walk-out lower level with recreation room, full-sized granite bar, bedroom, full designer ceramic tile bath, fitness room, playroom/media room and huge storage room. Whole house generator for power protection. 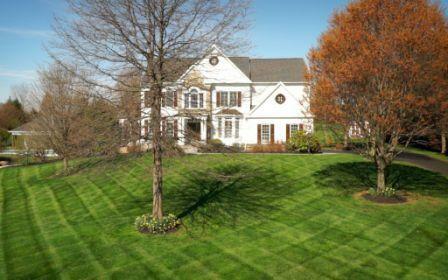 Stunning 5BR/3.5BA colonial with two-car detached garage on white picketed premium corner lot in sought after Arora Hills. The Carroll II model features approximately 4,500 square feet of comfortable living space on three levels. Entering from the brick walk & front porch through the gorgeous oak front door reveals custom painting, elaborate mouldings, African Walnut hand-scraped wide-plank hardwood and ceramic flooring throughout; foyer into formal living room featuring decorative columns and bay window; dining room with floor-to-ceiling windows and tray ceiling; main level office with bay window; family room with double exposure, gas fireplace, flows into kitchen/breakfast area; gourmet kitchen with 42-inch cabinetry, Corian countertops with center island, NEW Kenmore and Bosch stainless steel appliances and breakfast bar area; breakfast area with access to 9x20 Fiberon Horizon deck and Pergola; spacious master bedroom with sitting area and walk-in closet; ceramic tile luxury master bath with dual vanities; separate soaking tub and shower with glass enclosure; three additional bedrooms with carpeting on upper level and full ceramic tile hall bath; upper level laundry room; fully-finished walk-out lower level with recreation room, 5th bedroom, separate playroom, full ceramic tile bath, recessed lighting, NEWER HVAC units (2013) and plenty of room for storage. Shopping nearby includes the New Seneca Meadows shopping center featuring Wegmans and Milestone. Conveniently located in close proximity to Arora Hills and the Greenway Village subdivision is the newly-designed, vibrant Clarksburg Village shopping and retail center featuring Harris Teeter, Starbucks, mixed use shopping, and restaurants. Neighborhood amenities include sidewalks, pool(s), tot lots and jogging/walking paths. 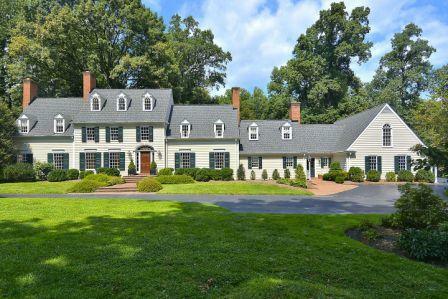 Stately brick-front 4BR/3.5BA colonial with two-car garage in sought after Willows of Potomac. This home features approximately 4,000 square feet of living area on three levels including: a great sense of light and spaciousness with 9-ft ceilings on the main level; designer home appeal with NEW custom painting throughout, hardwood floors (1/2 NEW) on main level, NEW designer stamped pattern carpeting in family room, and elaborate mouldings throughout; formal living room opening to formal dining room with bay window; gourmet kitchen with NEWgranite countertops, NEW stainless KitchenAid appliances, island/breakfast bar, beverage center, and breakfast room with sliding glass door to expansive deck; adjacent step-down family room with 10-ft. ceiling and wood-burning brick fireplace; master bedroom suite with huge walk-in closet and master bath with Jacuzzi soaking tub and separate shower; three additional bedrooms all on the same upper level with ceramic tile full bathroom in the hall; full daylight, walk-out lower level recreation room with recessed lighting, separate kitchenette, designer slate tile full bathroom, craftsman woodwork, and multiple storage rooms and closets. Professionally manicured landscape and multi-level deck with stairs to the rear yard. Renovated 2BR/1.5BA three-level townhome in Landsdowne backing to open common area. Special features include: NEW custom painting throughout, NEW gleaming hardwood flooring on the entire main level, NEW 12-inch Dura Ceramic tile floors in the full bathroom, NEW neutral carpeting on the upper level, and NEW lighting. Floor plan includes foyer entrance with Andersen storm door; living room with NEW granite pass through to kitchen; completely remodeled gourmet kitchen and breakfast area with NEWLY painted cabinets, NEW granite countertops, NEW undermount sink and faucet, and NEW Whirlpool stainless appliances; sliding glass door to private expansive deck overlooking partially fenced yard and open common area; two upper floor bedrooms with vaulted ceilings, ceiling fans and double-door closets; full bathroom with ceramic tile tub surround; lower level unfinished basement NEWLY painted floors, rough-in for full bath, and laundry center. NEW vinyl siding, aluminum wrapped wood trim, gutters, and vinyl double hung replacement windows (2014). NEWER water heater (2011) and HVAC (2006). NEWER architectural shingle roof (2006). Low maintenance and well-established perennials in professionally landscaped yard. Easy access to Interstates 395/495 and to the Franconia-Springfield and Van Dorn Street Metro stations. Convenient to nearby shopping at the NEW Hilltop Village Center across from the neighborhood anchored by Wegmans & LA Fitness as well as Landsdowne Center connected directly to the neighborhood. 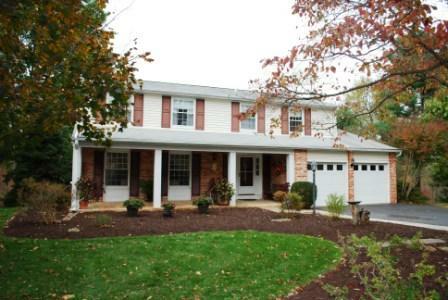 Spectacular 3BR+Den/3BA end unit townhouse/condominium in close-in North Bethesda locale. Approximately 2,000 sq. ft. of living area on three levels just a few blocks from Grosvenor Metro (Red Line). Designer home appeal including: hardwood flooring on entire main level, NEWpatterned carpeting, custom painting & window treatments throughout. Foyer with marble tile flooring; TOTALLY RENOVATED gourmet kitchen with designer ceramic tile flooring, painted and glazed cabinetry with self-closing drawers and glass doors, granite countertops and ceramic tile backsplash, stainless steel Bosch & KitchenAid appliances, recessed lighting, granite island/breakfast bar, and bonus wine bar; separate dining room with hardwood flooring and box/bay window; living room with hardwood flooring, wood-burning fireplace and French door leading to deck; master bedroom with designer patterned carpet and vaulted ceiling; renovated master bath with marble tile and two-person Jacuzzi soaking tub; two additional bedrooms upstairs with designer patterned carpet and renovated hall bath; lower level recreation room with full day-light windows, den/4th bedroom, another renovated full bath, laundry area and plenty of storage. Grosvenor Park provides a close-in local with acres of greenery, pond, walking trails, play areas, local gourmet Grosvenor Market http://www.grosvenormarket.com/, dry cleaner and hair salon. Easy walk-able access to Metro, Strathmore Music Center https://www.strathmore.org/, and Rock Creek Park hiking and biking trails. Incredible opportunity to become a part of Rockville history. The Hurley-Carter House was built in 1870 and designated a Historic Home in 2001. The current owners expanded, modernized and totally restored the home, earning them the Peerless Rockville Preservation Award in 2008. 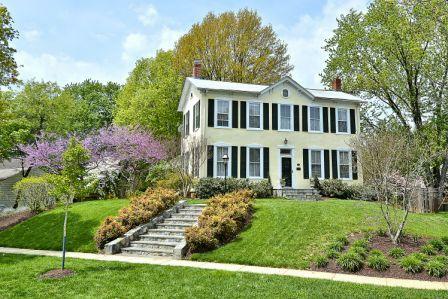 This 5BR/2.5BA Italianate farmhouse was built and operated on “Flint Ledge Farm” (aka "Winding Lane Farm") in the mid 1800s just after the Civil War by the Hurley family. The Hurley family expanded this vintage home during their 133 years as residents. The current residents took ownership 12 years ago and thoroughly updated the home while preserving and enhancing its historic character and warmth. The homes storybook charm, original architecture, and period detail is coupled with modern kitchen and baths. Made of wood-frame construction with fieldstone foundation, timber beams and covered with stucco, this home features approximately 2,604 sq. ft. of comfortable living space on two levels above grade plus a partially finished lower level with connecting stairs from the main level and Bilco double door access to outside. Outstanding features include random-width hardwood flooring, original detailed mouldings, custom built-ins throughout the home, NEWLY RENOVATED ceramic tile & slate baths, 10-ft and 8.5-ft ceilings, and NEW custom painting inside & out. Grand center hall foyer entrance; expansive formal living room and dining room each with double windowed exposure and fireplaces; EXPANDED granite & stainless kitchen with painted & glazed cabinetry, center island, and separate desk area; family room with custom built-ins flanking gas fireplace and custom Pella windows and door to back yard; five upstairs bedrooms and two full baths; upper hallway with wood floors and rear staircase to/from kitchen and family room; wonderful outdoor living space including a flagstone patio with stacked stone retaining walls and hot tub enticing you to sit for hours overlooking manicured gardens. Welcome to this classic, custom-built Williamsburg colonial exquisitely sited on a 3+ private acres in prestigious Bradley Farms. Renovated by renowned local builder Brendan O’Neill in 1990, the 7BR/5FB/3HB masterpiece with three-car side load garage exudes character and charm and is designed with a versatile floor plan that focuses on today’s family living and entertaining. Constructed with only the finest quality construction materials, the residence offers approximately 10,000 sq. ft. of finished living space on four levels including a combination of vaulted, cathedral, and beamed ceilings, eight fireplaces, elegant mouldings, and hardwood flooring throughout. Impressive two-story foyer flows into a regal reception hall; sun-drenched gallery leads into study with two walls of custom built-ins; grand salon with dual arched doorway entrances, ornate fireplace and a wall of French doors and atrium windows; stately great room featuring cherry raised paneled walls, ceiling beams and fireplace surround; dining room with raised paneled custom display niches and cabinetry flanking a fireplace; florida room boasts a wall of atrium windows and terra-cotta tile flooring; gourmet kitchen with custom maple cabinetry, center island and breakfast area with 12-ft. window bench seat; separate private guest suite with its own family room, bedroom and full ceramic tile bathroom; master bedroom suite with dressing area and custom marble master bath; four additional bedrooms on upper level with three full bath and separate laundry room; bonus fourth level features a loft area/bedroom; lower level recreation room with separate bar area, den/exercise room and tons of additional storage. Enjoy entertaining on the expansive flagstone patio overlooking specimen trees and pristine landscaping allowing for a peaceful and private setting. Convenient to Capital Crescent Trail, C& O canal, downtown Bethesda, Washington DC, two major airports, Congressional Country Club and Potomac Village shops/restaurants. Investor Special! Being sold strictly “AS-IS.” House needs work so cash, construction financing or FHA 203(k) loan is more than likely a requirement. HVAC not operational, no carpet or flooring in upper and lower levels, previous water in basement. Property has a ton of potential and is sited on a premium corner lot. 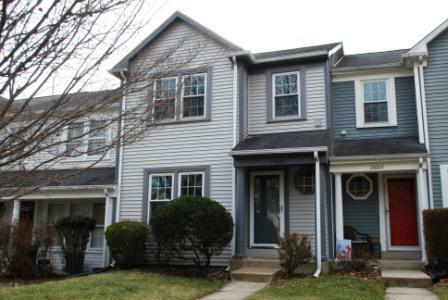 Three level end-unit townhome with 3BR/3.5BA and assigned parking. Hardwood floors throughout living room and separate dining room; powder room on main level; kitchen off the back of house with sliding glass door to fully-fenced in backyard; spacious master bedroom suite with private bath; additional two bedrooms on upper level with hall bath; partially finished basement with recreation room, laundry room, and third full bath. 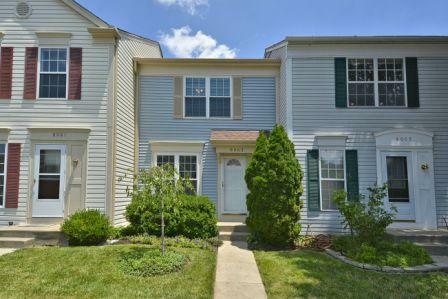 Conveniently located close to shopping, restaurants and I-270 corridor. Fabulous light-filled two bedroom, two bathroom condo in a pet-friendly community overlooking serene courtyard. Great downtown Rockville location and across the street from the Rockville Metro. Approximately 1,053 sq. ft. of living space including NEW custom painting, NEWLY buffed hardwood flooring throughout the entire unit, and NEW lighting. Open floorplan features living room and dining room combination with triple glass door slider to concrete balcony; kitchen with NEW granite countertops, ceramic tile backsplash, NEW under mount sink and pull-out sprayer faucet; master bedroom with a wall of closets, NEW ceiling fan with light, and sliding glass door/window; master bathroom with ceramic tile floors and tub surround; additional bedroom with NEW ceiling fan and walk-in closet; full hall bathroom with ceramic tile flooring and wall surround. 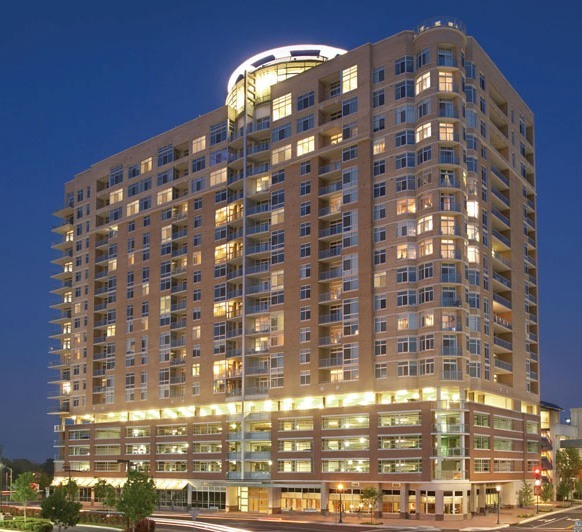 Americana Centre provides quiet, mature natural surroundings yet so close to everything that Downtown Rockville has to offer. The condo fee includes all utilities, common area maintenance, and various amenities such as: an outdoor pool, fitness center, 24/7 staffed front desk (118 Monroe building), and on-site management and engineer; one assigned surface parking space right outside the building entrance (#522) and plenty of visitor spaces. Be part of the newly designed, vibrant Rockville Town Center featuring shopping, fine restaurants, sidewalk cafes, the Rockville Regional Library, Regal Cinemas and other entertainment and cultural facilities. 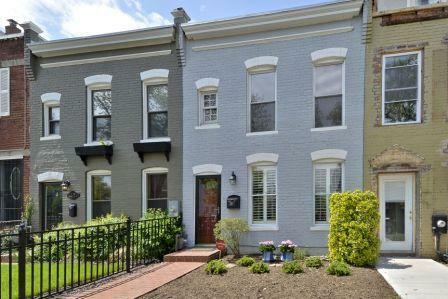 Classic, brick front 2BR/2BA Federal style row house located in vibrant Southeast DC. This home boasts over 1,150 square feet of comfortable living space on two levels featuring: custom painting, recessed lighting, hardwood and ceramic tile flooring. Living room that opens to dining area; remodeled gourmet kitchen with cherry cabinets, stainless steel appliances, granite countertops, subway tile backsplash and granite center island; separate breakfast area with access to flagstone patio and private backyard; en-suite bedroom with double-door closet, ELFA closet system and walk-out access to NEW 16x16 Evergrain rooftop deck; full ceramic tile bath on upper level; spacious second bedroom with Berber carpeting and ELFA closet system; second full ceramic tile bath and laundry area with ELFA closet system on main level; NEWER roof and hot water heater; NEW fully fenced-in backyard with custom flagstone patio, extensive hardscape, gravel parking pad and shed. Community garden located directly behind house. Close proximity to all the amenities that Capitol Hill has to offer including the Washington Navy Yard, Eastern Market, Barracks Row, shopping, restaurants and Metro Stadium-Armory access. 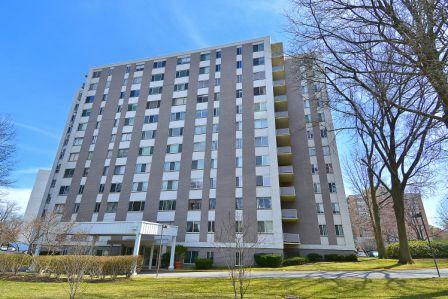 Immaculate 2BR/2BA corner unit with views of Lake Churchill. This home features approximately 1200 sq. ft. of living area on one level with an open floor plan. Covered front entry to foyer entrance with ceramic tile flooring, coat closet and laundry area; NEWER neutral carpet and ceramic tile throughout; family room with gas fireplace and sliding glass door with vertical blinds to balcony and picturesque views; separate dining room with NEWER neutral carpet; remodeled kitchen includes ceramic tile flooring, NEW granite countertops and sink, NEW Whirlpool stainless steel appliances; master bedroom with NEWER neutral carpeting and spacious walk-in closet with double exposure and access to balcony overlooking lake; full bathroom with ceramic tile flooring and vanity with mirror above; second bedroom with NEWER neutral carpet and access to second full ceramic tile bath. Both bedrooms and family room with views of the lake. 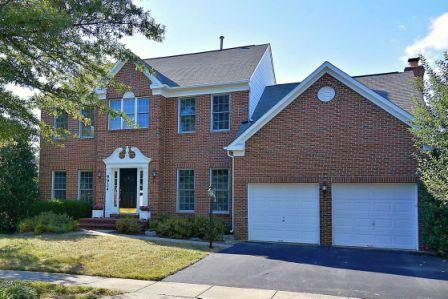 Conveniently located close to commuter routes, I-270 and the Marc train. Shopping nearby includes the New Seneca Meadows shopping center featuring Wegmans and Milestone. Be part of the newly-designed, vibrant Germantown Town Center featuring mixed use shopping, office, restaurants, sidewalk cafes, parks, the Black Rock Center for the Performing Arts, Germantown Library, Regal Cinemas and other entertainment. Neighborhood amenities include two pools (membership available), tennis and basketball courts, Black Hill Regional park, lakes and trails. Stately all-brick 4BR/4.5BA colonial with a PREMIUM oversized lot backing to parkland and siding to a tree-lined common area in The Gates at Avenel. 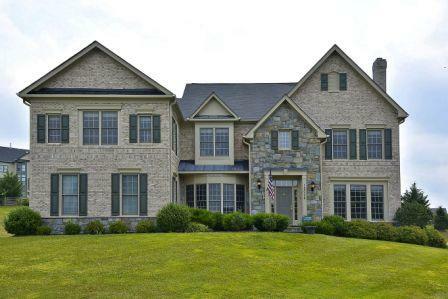 Built by Rocky Gorge Builders, this prestigious courtyard home is the largest of the models at approximately 4,863 square feet of living area on three levels with a two-car attached garage. Enjoy a great sense of light and spaciousness from the main level 10-ft. ceilings, soaring two-story ceilings in the foyer and living room, and oversized windows; NEW custom painting and elaborate mouldings throughout; NEWLY refinished hardwood floors (2014) throughout all three levels; ceramic tile floors and wall surrounds in all baths. Dramatic two-story foyer entrance flows into elegant executive-sized step-down living room with soaring ceilings, gas fireplace, and Palladian windows; formal dining room with triple window overlooking side yard; gourmet granite and stainless kitchen with Subzero & Thermador stainless appliances, center island cooktop, and breakfast area; adjacent family room with gas fireplace, built-ins, walls of windows, plantation shutters, and French door to expansive deck; main level study with a wall of built-in bookshelves, cabinets and drawers; master bedroom suite with sitting room, wood-burning two-way fireplace, wet bar, and dual walk-in closets; luxurious master bath with hardwood & ceramic tile floors, Jacuzzi whirlpool tub and separate shower with glass enclosure; two additional en suite bedrooms upstairs with walk-in closets and full ceramic tile baths; fully-finished walk-out lower level featuring an enormous recreation room with recessed lighting, full-sized wet bar and storage room/wine cellar; fourth en suite bedroom with walk-in closet and full bath; exercise room/den with French door to flagstone patio, fenced back & side yard, and in-ground pool; conveniently located near TPC at Avenel Farm, Congressional Country Club, Avenel Swim & Tennis Club, and Avenel Park with ball fields & playgrounds; minutes from Potomac Village shopping & restaurants. Striking, sun-filled, corner penthouse 3BR/2.5BA condo with breathtaking panoramic views from the 17th floor overlooking DC, Tysons Corner and Sugarloaf Mountain. Separate storage room and two secure underground parking garage spaces are included in the sale. This rare keystone unit spans 1,945 sq. ft. and offers an open floorplan with two master bedroom suites and bonus third bedroom or den separated by grand living areas and double balconies. Model home décor including: 10-ft ceilings, hardwood floors in foyer, powder room and hallways as well as all the grand entertaining areas (currently has designer carpeting installed over top), fashionable carpeting in all three bedrooms, porcelain tile in the bathrooms, chic custom painting and custom window treatments throughout. Foyer entrance with dome ceiling flows into open great room featuring a living room/dining room with dramatic cylindrical wall of windows and sliding glass doors leading to private balcony overlooking sunset, city and mountain views; chef’s kitchen with Italian cabinetry, upgraded granite, high-end GE Monogram appliances, island breakfast bar, recessed lights and pendant lighting; bonus workstation area off of kitchen with matching Italian cabinetry and granite L-shaped desk top; MBR suite with two walk-in closets; lavish master bath with designer porcelain tiled floors, shower and tub surround, his and hers granite vanities, Jacuzzi whirlpool tub, and separate shower with frameless glass enclosure; second bedroom suite with walk-in closet, sliding glass doors to second balcony, and equally well-appointed granite and tile bathroom; third bedroom/den with built-in entertainment center; laundry room with full-sized washer & dryer. Midtown Bethesda North offers: an elegant boutique hotel-inspired lobby; 24-hour staffed front desk; lobby lounge and cyber café with complimentary gourmet coffee; state-of-the-art fitness center; 20th floor Skybox club room with wet bar, big screen TV, and catering kitchen; rooftop outdoor pool, sun deck, hot tub & barbeque area; private theater room; guest suite for overnight guests; board room with kitchen for meetings; and daily retail conveniences outside your front door. 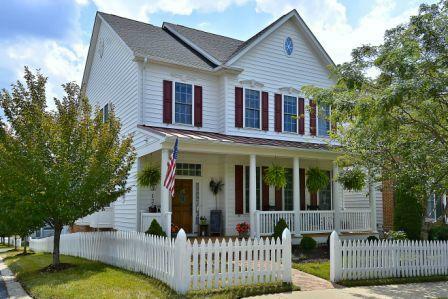 Stunning renovated 4BR/2FB/2HB colonial surrounded by mature trees on premium cul-de-sac lot backing to common area. The Oakwood model features over 3,200 square feet of comfortable living space on three levels including fine craftsmanship, detail and quality materials throughout with over $200,000 of improvements. Entering from the brick walk & front porch through the gorgeous mahogany front door reveals custom painting, elaborate mouldings, hardwood and ceramic flooring throughout; living room with floor-to-ceiling windows and designer carpeting; formal dining room; gourmet kitchen with custom cherry cabinetry, granite countertops and backsplash, stainless appliances and breakfast bar area; breakfast room with box bay window overlooking backyard and separate laundry closet on main level; family room with cathedral ceilings; brick wood burning fireplace, built-in bookcases and French doors to an expansive 12x30 elevated deck; spacious master bedroom with walk-in closet and custom shelving; luxury master bath with Travertine tile floor and shower, Amish solid cherry vanity with granite countertops; three additional bedrooms with carpeting on upper level and renovated marble hall bath; fully-finished walk-out lower level with recreation room, exercise and game room, renovated half bath, wet bar, recessed lighting and beautiful custom built-in wall-to-wall bookcases; separate storage areas and workshop with tons of storage; walk-out to a 12x12 flagstone patio overlooking fully fenced-in professionally landscaped back yard with extensive hardscape. 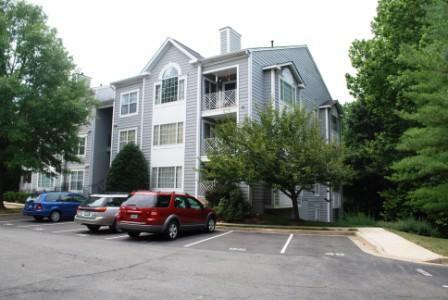 Conveniently located close to commuter routes, I-270 and the Marc train. Shopping nearby includes the New Seneca Meadows shopping center featuring Wegmans and Milestone. Be part of the newly-designed, vibrant Germantown Town Center featuring mixed use shopping, office, restaurants, sidewalk cafes, parks, the Black Rock Center for the Performing Arts, Germantown Library, Regal Cinemas and other entertainment. Neighborhood amenities include two pools, tennis and basketball courts, Black Hill Regional park, lakes and trails. 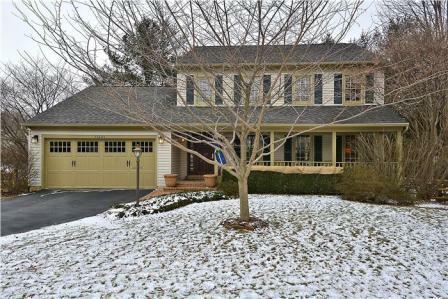 Remodeled 5BR/2.5BA colonial with covered front porch entrance and two-car garage in a serene setting on 1.123 acre lot backing to woods and stream. This home boasts over 3,200 square feet of living area on three levels featuring: custom painting, elaborate mouldings, hardwood floors on entire main level, ceramic tile floors in all baths, upgraded carpet, and renovated kitchen and baths. Foyer entrance with hardwood floors; living room opening to formal dining room; gourmet granite kitchen with pecan cabinets and mobile center island; separate breakfast area with sliding glass door to deck overlooking private backyard; adjacent family room with floor-to-ceiling brick wood burning fireplace and custom built-in bookshelves; remodeled granite and pecan powder room; master bedroom suite with walk-in closet, and remodeled master bath with pecan vanity, designer ceramic tile floor and glass enclosed walk-in shower, four additional bedrooms all on the same upper level with second renovated designer ceramic tile bath; fully-finished lower level recreation room with Berber carpet, recessed lighting, and daylight windows; professionally manicured landscape; conveniently located across the street from Milton Kaufman Park and nearby Lake Whetstone Park and Seneca Creek Park. Renovated 3BR/3.5BA townhome in Norbeck Manor backing to private tree-lined common area. This home spans almost 2,200 sq. ft. of living space on three levels. Special features include: NEW custom painting throughout, gleaming hardwood flooring on most of main level, NEW 12-inch Dura Ceramic tile floors in kitchen & powder room, and NEW neutral carpeting on upper and lower levels. Floor plan includes foyer entrance; remodeled gourmet granite and stainless kitchen with NEWER appliances and breakfast area; formal dining room with pass through to kitchen; step-down living room with 9-ft ceilings and sliding glass door to private expansive deck overlooking private back yard; master bedroom with vaulted ceiling and double-door closet; master bathroom with carpeted makeup vanity and sink area in bedroom, ceramic tile floors in bathroom area and tub with ceramic tile surround; two additional bedrooms with ceramic tile hall bathroom; walk-out lower level recreation room with built-in bookcases, recessed lighting, and sliding glass doors to lower deck and private rear yard. laundry room with bonus craft room/den/exercise room; full bath; storage area under stairs. Newer roof, siding and vinyl replacement windows. Low annual HOA fee. 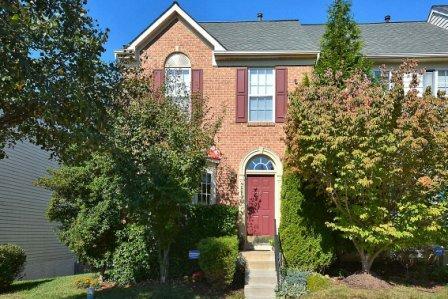 Stunning 3BR+Den/3.5BA brick front end-unit townhome backing to tree-lined common area. This home features almost 2,700 square feet of living area on three levels including: a versatile floorplan with open, flexible spaces; a great sense of light and spaciousness with 9-ft, 11-ft, & vaulted ceilings; designer home appeal with hardwood and ceramic tile floors, custom painting and window treatments throughout. Foyer entrance with powder room; formal living room with double bay windows and dining room; gourmet kitchen with NEW granite countertops and center island; dining area which opens into the adjacent family room (alternate separate dining room); master bedroom suite with vaulted ceiling, walk-in closet, sitting room, and lavish ceramic tile master bath with soaking tub and separate shower; two additional bedrooms with full ceramic tile bath; lower level walk-out recreation room with full bathroom, separate den/BR, utility room and separate storage room; 3-level optional bump-out provides extended recreation room, breakfast room/sunroom and master bedroom sitting area. Enjoy the privacy sitting on your deck or brick paver patio backing to trees. The Villages of Urbana community includes tot lots/playgrounds, pools, tennis courts, community center, new schools, state-of-the art library and market district with shops and eateries.